CCT to hold Saraki, Ngwuta’s trial daily – Royal Times of Nigeria. 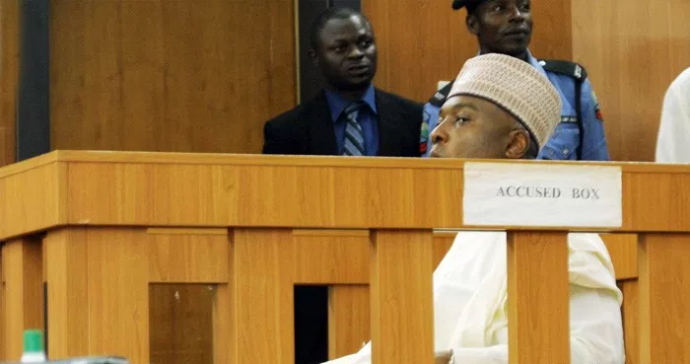 The Code of Conduct Tribunal has said the trials of Senate President Bukola Saraki, Supreme Court Justice, Sylvester Ngwuta, and others currently would continue on a daily basis, Premium Times reports. The CCT stated this in its practice direction manual for the year 2017, which said; “Hearing of cases shall be from day-to-day basis as the diary of the tribunal may permit for the purpose of fair and speedy trial”. The manual was signed by the Tribunal’s chairman, Danladi Umar, and a member of the CCT, William Atedze. It said trials will start at 9 a.m., every working day, stressing that no attempt to frustrate the speedy dispensation of matters at the tribunal would be tolerated. Saraki is facing an 18-count charge for false declaration of asset while Ngwuta was slammed with an eight-count charge on the same offence.